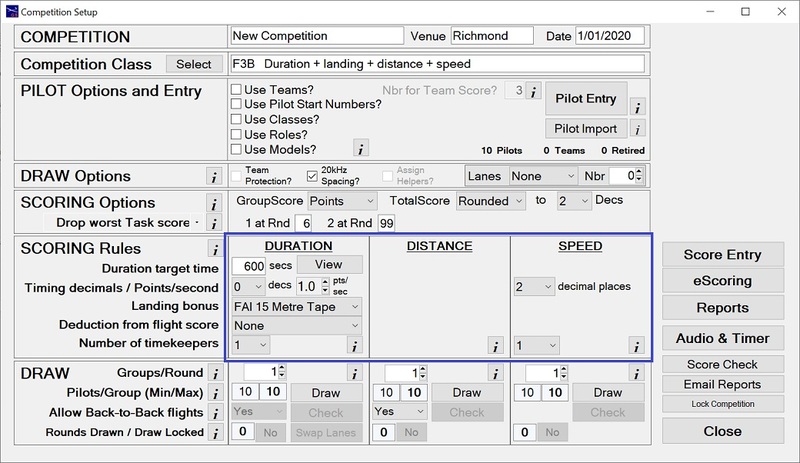 GliderScore makes the running of F3B comps as easy as it can be. entering and calculating the scores, and instantly producing the reports. the order separates pilots on the same frequency and/or in the same team. The distance draw is totally separate from the duration draw to maximise fairness. Can select any or all three tasks. Run speed and distance only if desired. Creates an optimised draw that avoids frequency and/or team clashes (except speed). A speed group can be split into two, and split again if necessary. Deducts drop scores (for each task) at selected number of rounds flown. Score cards can be printed for the duration task from the Reports menu. Expand F3B on the side menu to work through these features. Watch the Comp Setup F3B video.